Help our poor kitty reach the highest floor and not get in trouble. 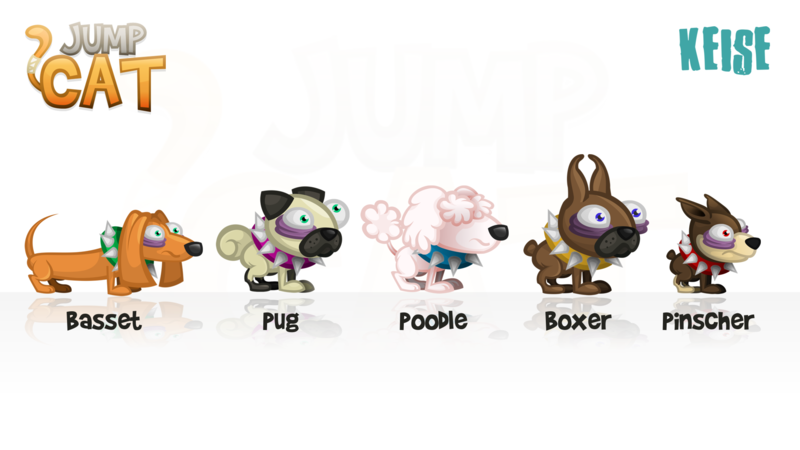 In Jump Cat, you'll have to jump to the highest floor you can reach, one by one. But be careful with the dogs, they don't like cats so much. "Only the slyest of cats will be able to jump non-stop while fooling the dogs." Popular game in July 2015 thepopularapps.com. Founded by friends who joined their passion for games, art and programming, KEISE Entertainment was founded in 2015 with a great goal: entertain a diverse audience with digital games. In 2013, before we started developing our own games, our team participated in the production and creation of the game Jelly Tale along with the laboratory of digital games of UTFPR-CP, it being our first release and a great boost to the creation of KEISE. Entertain our audience and developing games is what makes our team work harder every day bringing more and more innovative titles for the digital games market. More information on KEISE Entertainment, our logo & relevant media are available here.